When a printed circuit board is exposed to atmospheric moisture and airborne contaminants, it damages the circuits, resulting in deteriorated performance and component malfunction. Damage can also be caused by abrasion or exposure to shock and vibration. To prevent these and other issues, printed circuit boards are often treated with chemical resistant coatings prior to product assembly. Conformal coatings are a chemical film that is applied to circuit boards to provide electrical insulation and protection against moisture, chemicals and harsh environments. Circuit board coatings are made from epoxy, urethane or silicone-based substances and are applied using a brush or by dipping or spraying the PCB. The result is a lightweight, clear and non-conductive coating that provides protection and helps increase the reliability and operating life of a component. 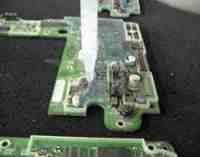 Another use of conformal coatings for circuit boards is to provide enhanced security against tampering and data theft. Companies often request circuit board protection service for new products and designs that they are just developing or releasing to make copying or reverse engineering of the internal workings far more difficult. Plasma Ruggedized Solutions’ conformal coatings, potting and encapsulation processes offer physical protection of the treated electronic components. Circuit board protection services include engineering, design and prototyping to provide circuit board coatings that meet your exact requirements. Request a quote today or contact us to learn more about our available options for customized circuit board coatings. Conformal coatings for circuit boards undergo a more involved curing process, using both ambient and thermal cure to develop their hard finishes. This results in circuit board coatings that are considerably thicker than coatings used for other purposes. Standard coatings are approximately 3 mil thick but conformal coatings for circuit board protection are typically between 4 and 5 mil, which is the upper range of possibility for coating thickness. Our customized circuit board coating options include epoxy coatings, urethane coatings, and silicone hard coatings that provide superior physical protection and are difficult to remove or rework, making physical tampering nearly impossible. We can also add opaque conformal coatings for circuit board protection to hide writing, legends, and names (manufacturers, etc.) on components. Circuit board coatings make treated products much more physically robust and resistant to chemicals and moisture, creating a better overall product with a longer potential operating life. The most effective coating methods for circuit board protection are potting and encapsulation, which can be used for individual PCBs or entire assemblies. Since the entire electronic assembly can be enclosed using this process, encapsulation can also be used for the creation of FIPS compliant components. Epoxy coatings are the most common for this service, but we offer a wide range of chemical resistant coatings to meet your project’s requirements. Whether you need something with low or high thermal transmission qualities, opaqueness for visual security, or any other special properties, our experts will work with you to create the ideal solution for your needs. We can also assist in the design of special housings, shells, or other casings for your assemblies to add a further level of security. Plasma Ruggedized Solutions works with various industries to provide conformal coating engineering and design solutions for improved protection and security. Request a quote today or contact us for more information about conformal coatings for circuit boards.